The first thing I noticed about the Lotus 30 was the exhaust sticking out the back of the car. I just had to know more. 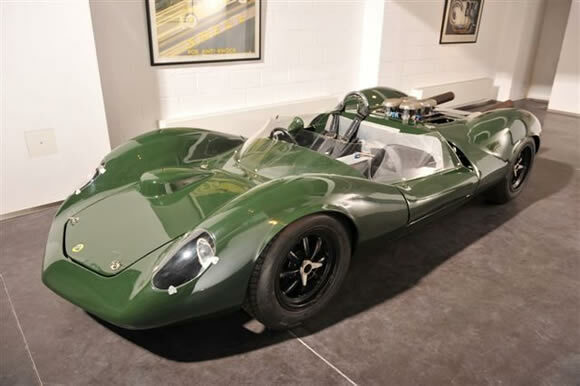 Known for it's beautiful fibreglass body and chassis design the Lotus 30 was said to be faster than Formula One cars of the time and a lot more dangerous to drive due to poor weight distribution and aerodynamics. Lifting the nose at speed would definitely put the wind up you. Jim Clark managed to pick up a few wins but it wasn't that successful. Lotus used a 4.7 litre Ford V8 developing 350bhp, up to 360bhp with fuel injection, to power the 1500lb beast: giving it an estimated 200mph top speed. Quite phenomenal in 1963 Sports Car racing. 33 Lotus 30's were produced and the best story I have found so far is one was registered for the road in the 1970's. Imagine being on the road in something as scarey and as unsafe as this? Yep, I got a smile thinking about that too. Beautiful cars with a great history.